How Do You Become Mayor of Dallas? They say, to win an election, you have to shake a lot of hands and kiss a lot of babies. Just for good measure, let's add that you have to throw a lot of Mardi Gras beads! Yesterday was a crisp, sunny day - perfect for the annual Oak Cliff Mardi Gras Parade. Just like the neighborhood, the float participants and the crowd gathered to watch the parade included an unique and diverse mix of characters. 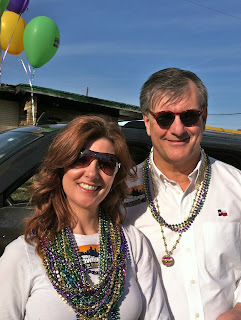 I got to ride along with Dallas Mayoral candidate, Mike Rawlings, as he and his team shook hands, greeted constituents and tossed beads to the crowds. He had come to the parade straight from two church appearances earlier that morning, followed by a lunch meeting. The life of a political candidate is busy. We didn't gauge our bead inventory very well, because we ran out of beads about halfway through the route. Mike saw some little girls who had a card table set up selling Girl Scout cookies. He ran over and bought a case of cookies. We all grabbed sleeves of cookies and started handing out Thin Mints and Do-Si-Do's. Genius!! Check out the crowds! There were massive amounts of people. What a fun day! For more information about Mike Rawlings campaign for Dallas Mayor, visit http://www.mikerawlingsfordallas.com or join his Fan Page on Facebook to stay connected for news and updates from the campaign trail.